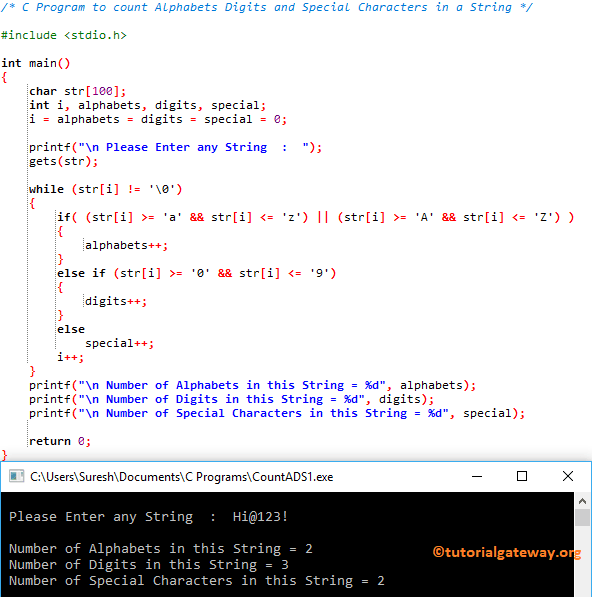 In this article, we will show you, How to write a C Program to Count Alphabets Digits and Special Characters in a String with example. For this we are going to use Built-in function isalpha, isdigit, and ASCII Codes. This program allows the user to enter a string (or character array). And then it will check, how many number of Alphabets, digits, and Special Character inside that string. In this program, we are using the alphabets and digits directly inside the Else If Statement. First we used While Loop to iterate each and every character in a String. The condition is True because str = H.
Within the While Loop we used Else If Statement to check whether it is a Alphabet, digit, or Special Character. The condition is True because str = i. The condition is True because str = @. In this program we are using For Loop to iterate each and every character in a String. Next, we used the ASCII values to check whether individual character of a string is Alphabet, Digit, or special character. I suggest you to refer ASCII Table to under the ASCII values of each and every character. This program is same as the first example but this time we are using the pointers concept.